Red Bank, NJ Hulafrog | Save The Date: Experience the Magic of Lights! 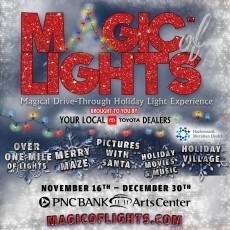 Save The Date: Experience the Magic of Lights! A great holiday event to kick off the season right with your clan. Magic of Lights at the PNC Arts Center features over a mile of spectacular light displays including Candy Cane Lane, 12 Days of Christmas, a twinkling Snowflake Forest and The Night Before Christmas. Experience the thrill of Magic of Lights from the comfort of your own car as you wind through a winter wonderland but don't forget to stop at the Holly Jolly Village for hot cocoa, s'mores, holiday music & movies...and SANTA! Purchase your tix in advance at magicoflights.com or psst...visit the Hulafrog Red Bank FB page- we are giving away a family pass to one lucky winner! NJ will shine bright as guests weave through a spectacular winter wonderland drive through lights display which opens Friday, Nov 16 and runs through Sunday, Dec 30. Opens at dusk daily, closes 10PM Sun-Thurs, 11PM Fri & Sat. Magic of Lights will feature themed light displays using the latest LED technology and digital animations, including Candy Cane Lane, 12 Days of Christmas, a twinkling Snowflake Forest and The Night Before Christmas. A special feature of the 2018 Magic of Lights is the Hackensack Meridian Health Jolly Holiday Village, a stop along the route where guests can get out of their cars and walk through a winter wonderland of hot cocoa, s’mores by the fire pit, holiday music & movies, hay maze, pictures with Santa himself and much more. Holiday Event at Middletown Arts Center! 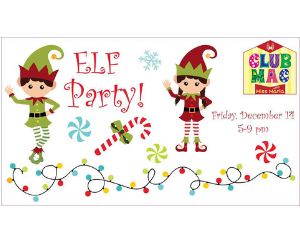 Join us for an Elf Party on December 14th at Middletown Arts Center! 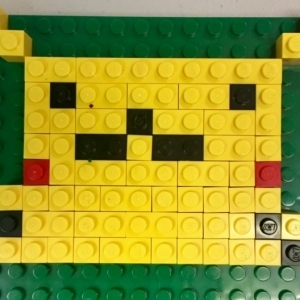 We will watch a live performance of Elf Jr. in our theater (which premieres for all on 12/15), play some super fun games, and make a present for our favorite elf! Pizza, drinks, and snacks are included!